Mugshots of Frankie Russell and Bob Tait. Daily Province, 21 March 1917. Bob Tait was a black ex-soldier from Detroit. On the evening of 20 March 1917, he initiated a shoot-out with the police that ended as a murder-suicide that left Chief Constable MacLennan, Tait, and an eight year-old boy dead and a police detective blinded in one eye. Frankie was charged as Tait’s accomplice because police insisted that more than one person must have been firing based on the sound of the gunfire. Frankie’s testimony, unlike those of her police accusers, withstood a vigorous cross-examination and she was acquitted. Bob Tait’s shooting spree was the most sensational murder case the city had ever seen. For the reform-minded middle class, the tragedy helped illustrate the danger they claimed drug addiction posed to white society. As such, the case helped set the stage for the racialized drug panic that swept the city in the early 1920s and resulted in a dramatic escalation of Canada’s drug war. For neighbourhood residents, the incident endured as a staple of local folklore and has been memorialized with a tile mosaic at the corner of East Georgia Street and Jackson Avenue. 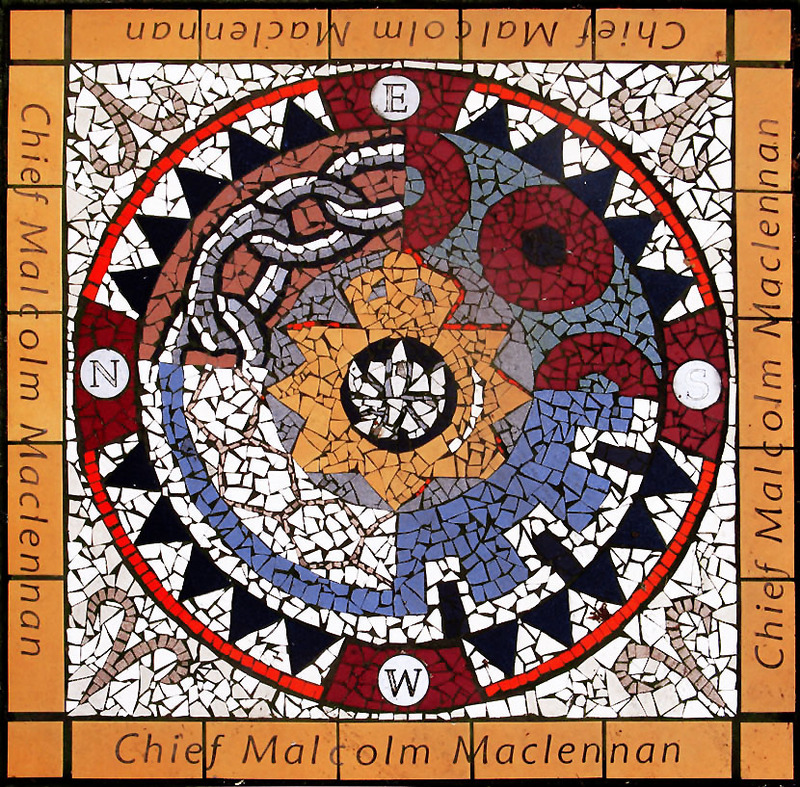 Chief MacLennan is the only Vancouver chief constable with an entry in the Dictionary of Canadian Biography and is one of the more notable line-of-duty deaths in the annals of Vancouver Police Department history. For those who have written about the case, it is significant not just because MacLennan was the city’s top-ranking lawman, but also that he was an early advocate for treating drug addiction as an illness, making it somewhat ironic that he was murdered by an addict. The incident is thus seen as an important moment in the early days of the east side’s complex drug problems that have confounded scores of policy-makers and police ever since. But Frankie Russell’s testimony – the version of events the jury found most credible – suggests that Tait’s drug use was only one and not necessarily the most decisive factor guiding his behaviour that night. Both Bob Tait and Frankie Russell were well-known to the police. Tait’s first run-in with Vancouver’s finest was in 1914 when Constable Quirk stopped him and another woman on the street. Tait whacked Quirk in the head with a bag of opium and the couple fled. After warning them to stop, Quirk fired his gun and hit Tait in the thumb. On other occasions, Tait and Frankie were charged with drug possession and being inmates in a disorderly house. Other charges populating Frankie’s criminal record included vagrancy, keeping a disorderly house, theft, and drunkenness. 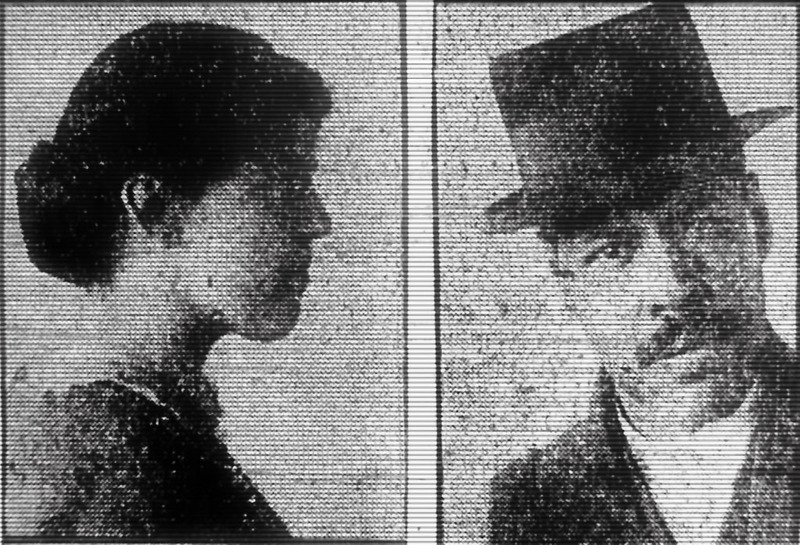 The couple relocated to New Westminster, but returned in 1916 after being given an ultimatum to either leave town or go to prison for living off the avails of crime. Back in Vancouver, Frankie and another man, a white man posing as her husband, rented an apartment above a Chinese grocery store at 522 East Georgia Street. Possibly she doubted the landlord would rent to a mixed-race couple. In any case, it was Tait in the apartment with Frankie when her landlord, Frank King, and his hireling, Hector McKinnon, kicked in their door the evening of 20 March 1917. The commotion woke Frankie and she came out of the bedroom to investigate. She recognized King, but when McKinnon refused to identify himself, she mistakenly assumed he was a bailiff. McKinnon did most of the talking and demanded that Frankie hand over the $20 in arrears she owed or immediately vacate the premises. Frankie had been refusing to pay rent until King had her roof fixed. Rainwater was causing the wallpaper to peel and once spoiled her groceries. But this time she simply told the intruders she didn’t have the money and asked for more time to raise it. When they refused, Frankie went into the bedroom to wake Bob Tait and see if he could lend her the money. He told her he didn’t have any. From inside the bedroom, Tait overheard the men aggressively interrogating Frankie. He hollered out that if McKinnon just served the eviction papers, he and Frankie would leave. McKinnon’s response to Tait was that he was going to “kick his face in.” Frankie informed McKinnon that he was talking to a sick man. He told her he didn’t give a damn. Tait came out of the bedroom wielding a shotgun. McKinnon reached into his pocket, but Tait warned him not to try anything. King finally spoke up, saying he wouldn’t leave. McKinnon persuaded him otherwise and the two men finally left. The encounter left Tait angry and frustrated. He had been sick for several days and was in pain from an injury he sustained falling down the stairs in an opium den while gathering information for the police. After the men left he further aggravated his agitation with drugs and alcohol. That night Tait consumed more intoxicants – namely cocaine, morphine, heroin, and whiskey – than Frankie had witnessed in the two years she had known him. 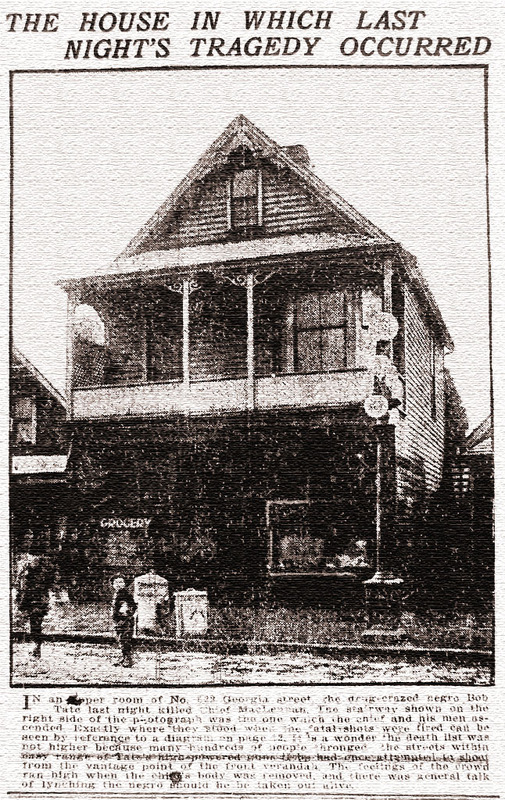 The landlord and McKinnon returned to the apartment with Constable Johnston. Tait refused to open the door, or to allow Frankie to open it, and shouted that he knew they did not have a warrant because they had not been gone long enough. Johnston called for back-up, and Detectives John Cameron and Ernest Russell came to negotiate with Tait. Tait’s anger became homicidal rage when he heard Detective Russell, whom he knew from working as a police informant. In exchange for being a “stool pigeon,” Tait was given immunity on drug-related offences. For reasons only alluded to in newspaper accounts, Tait’s relationship with the police was anything but amicable. Detective Russell knocked and told Tait through the door that he wished to speak with him. “I was long enough a stool pigeon and was crossed and double crossed,” Tait retorted. “I will go under before I go with you, Russell.” The detective persisted: “C’mon Bob, open the door, I want to talk to you. I never double-crossed you.” Tait responded with a shotgun blast through the door, hitting Cameron in the face just below his eye. The others were bloodied by the spray of glass shards from the door. Johnston and Russell managed to carry Detective Cameron out to safety. Detective Russell ran to the store on the corner to call for reinforcements. He came out and saw eight year-old George Robb collapse to the sidewalk from a bullet probably intended for the detective. He rushed over, wrapped the boy in his arms, and carried him to the safety of a neighbouring house. Russell accompanied George Robb to the hospital where he was pronounced dead from the bullet that had pierced his lung. The first of many reinforcements to arrive was a party led by Chief Malcolm MacLennan, Deputy Chief McRae, and Inspector Jackson. They smashed down the door with an axe and entered the apartment. MacLennan went ahead of the other men and into the room next to the one in which Tait was stationed. Police and Tait exchanged gunfire until Chief MacLennan was shot in the head and killed. The other men retreated from the apartment to avoid the same fate as their boss. With MacLennan’s passing, Deputy Chief McRae was now in charge and needed a plan. Several proposals were made on how to proceed. The fire department had begun assembling sulphur pots in the store below using garbage cans to try and smoke the couple out. McRae contacted the army to see about having a squad of soldiers sent over from Hastings Park to stage a military assault. The Seaforth Highlanders regiment offered to bring over a machine gun and riddle the house with bullets. Constable Ed Murphy, a returned soldier and grenadier, offered to make a batch of hand grenades and lead a bombing expedition into the building. The most dramatic proposal that the police seriously contemplated was to blow the building up with dynamite. Explosives were sent for, but because MacLennan’s body was still in the apartment, McRae decided they should begin with a barrage of gunfire. An ample supply of guns and ammunition had already arrived at the scene and McRae, Inspector Scott, and Constable Berry set up in an empty apartment across the street. Through a window facing the room in which they believed Tait was holed up, they riddled the apartment with bullets for about twenty minutes. Two officers then returned to the apartment and retrieved MacLennan’s body. For the remainder of the ordeal, Frankie lay frozen with fear in a bundle of blankets on the floor. One of the bullets whizzing above her head perforated her hair. Another mangled her hair ribbon and eventually she lost consciousness. She awoke to find Tait’s limp body sprawled on top of her. He had shot himself in the head, possibly believing he had killed Frankie. Frankie called out that Tait was dead. Inspector Scott shouted for her to “come out or I’ll shoot through the door, and then blow you up.” She freed herself, came out and surrendered to the police, who whisked her into a car and drove her to the police station before the crowd that had amassed outside realized she was in custody. According to press reports, this was a wise move because there was talk in the crowd about lynching Frankie and Bob Tait if they managed to come out alive. Frankie was charged as an accomplice in the murder of Chief MacLennan and held for three days before being allowed to see a lawyer. The key evidence against her was the police claim that the gunfire from within the apartment could not have come from only one person. Specifically, the shotgun used to kill the chief required two hands to operate and police reported hearing simultaneous shots from a revolver during the affray. Frankie denied doing any of the shooting or even that she knew how to use a gun. Police testimonials contradicted each other and were individually inconsistent. Frankie’s lawyer, for example, pointed out that Inspector Jackson testified that he was certain the first shot came from a rifle, but at the preliminary hearing was positive it came from a revolver. The number of shots fired had also changed in his second testimony. One of the jurors remarked that Inspector Anderson’s description of the gunfire would have meant there were three shooters, which no one claimed was the case. Other evidence presented against Frankie simply was not convincing. Frank King told the court he had seen a revolver protruding from Frankie’s pocket during his initial visit. McKinnon did not corroborate this claim, nor did King mention this in his earlier testimonies. Inspector Jackson found a Chinese man serving a sentence at Oakalla Prison to testify that he had seen Frankie with a revolver on previous occasions. Constable Laurancy Harris said that Frankie told her she was innocent, but another time had said she knew how to use a gun and that “if the ‘Dicks’ were not careful they would ‘get it.’” None of this evidence was sufficient or credible enough to implicate Frankie in the shootings in the minds of the jury. The police also failed to connect any of the guns or ammunition to her, and Frankie Russell was acquitted. The climate created by the murder of Chief MacLennan was not conducive to criticism of the police. The judge instructed the jury to consider what was going through the minds of police after Detective Cameron had been shot and the boy killed: “Was it the number of the shots fired, the spaces that elapsed between the firing of the shots and what kind of shots they were or how soon they could get Tait?” The prosecution suggested that discrepancies in police testimonies indicated they were not concocted. Even Frankie’s lawyer never questioned the honesty of the police despite their dubious testimonies. Police witnesses, however, never qualified their remarks during the trial; they all stated they were certain Frankie Russell participated in the shooting spree because of the sound of the gunfire. If those testimonies were not honestly mistaken, a reasonable conclusion is that the police wanted to see Frankie sent to the gallows for reasons of revenge, not justice, just as Tait predicted when he explained his murder-suicide plan to Frankie. Mosaic at East Georgia and Jackson streets commemorating the death of Malcolm MacLennan. According to historian Angus McLaren, the most common motive for British Columbian men to commit murder in the early decades of the twentieth-century was to defend against “challenges to their manhood.” Certainly Tait felt emasculated by his relationship with the police. Although details of the “crosses and double-crosses” Tait claimed he had been subjected to as a police informant are unknown, all accounts indicate he was triggered by Russell’s voice outside the door. A likely explanation is that he believed the police were setting him up to be sent to prison, thus circumventing the agreement they made for his work as an informant. considered an informer or something, a stool pigeon. Then he wasn’t liked, he wasn’t welcome around that part. Even the police didn’t like him. They’d use him til he was no more value to them, then if the crowds want to get him let them get him, he’s served their purpose. But that’s the way it run, off and on, like the fish in the sea: the big ones eat the little ones, if they could have them. To the extent Phillips’ impression can accurately be extended back to 1917, it raises the possibility that Bob Tait’s flight down the opium den stairs while working as a police informant was not an accident and that becoming a pariah was the price he paid to stay out of prison. His decision to take up arms that night may be morally indefensible, but it was a way to re-assert his manliness. From Tait’s perspective, the only source of power that had not been taken from him may have seemed to be the arsenal that he kept in the apartment for hunting. Tait’s course of action was motivated by desperation, not the drugs he took, his race, or criminal propensity, as historians and contemporary newspapers have variously implied. In choosing the tragic course he did, Tait conveyed in the strongest possible terms that whatever faith he may have once had that any legal recourse existed for someone like him had been exhausted. Certainly the lack of an eviction notice or police warrant at the outset of the conflict would have affirmed any such belief, as does the spurious charges brought against Frankie Russell. Meanwhile, the only consequence the landlord faced for initiating the conflict by illegally breaking into the apartment and threatening violence was a verbal reprimand from the judge. As an early chapter in Vancouver’s drug history, the murder of Malcolm MacLennan tells us more about the desperate circumstances confronting those excluded from “respectable society” because of some combination of race, class, gender, and addiction than it does about anti-social behaviour or ill-health brought on by drug use. An earlier version of this article appeared in vol. 40, no. 4 (PDF) of British Columbia History. This entry was posted in Uncategorized and tagged Bob Tait, crime, drug addiction, drugs murder, Frankie Russell, Hogan's Alley, Malcolm MacLennan, racism, Vancouver Police Department by laniwurm. Bookmark the permalink. Thanks for this interesting history. What became of Frankie Russell? Thanks, Erin. I checked the vital stats index on the BC Archives website to see if she died in BC and when. There are a couple entries that might be her, but can’t be sure. Most likely, she returned to obscurity. Aside from the events themselves, coming across the news coverage of her trial was a treat for me simply because people in Frankie’s station in life normally lived undocumented lives, leaving a lot of gaps in the historical record. Even her mugshots may very well have been the only photographs ever taken of her. I got into researching this and another Vancouver cop-killing ( https://pasttensevancouver.wordpress.com/2008/03/13/black-and-blue-life-and-death/ ) after reading the VPD’s history, which has a lot of great detail and info, but naturally tends to be overly cop-sided. Thanks for the response and the link. I find, after reading these stories, that it’s usually the women who I’m particularly intrigued by– how they went through their daily lives when Vancouver was just that more dangerous for them. I KNOW, THAT HE WAS MY UNCLE, BECUASE HIS PICTURE WAS ON THE WALL ONE SIDE OF MY BED. I REMEMBER MY GRANDMOTHER TALKING SOMETHING ABOUT IT. SO NOW I KNOW THE STORY. I LIVED WITH MY GRANDPARENTS FOR A WHILE, AS A KID AND AFTER CAME BACK TO MEXICO.